Avalokiteshwara is the Buddha of Compassion. 'Karuna,' in Sanskrit, means Compassion. Karuna Reiki is a system of Reiki that was created by Reiki Master William Rand as a result of his extensive work and research with healing methods. During his many years of practice he came across various systems and symbols that were being used by healers. He studied the systems and worked with the energy levels of the different healing symbols and incorporated the ones he found to have the best energy and formulated an attunement process by which one could access these symbols and use them in healing. He called the new system Karuna Reiki. The method of healing is the same as in Usui Reiki with the additional use of Karuna Reiki symbols. ‘Karuna’ is an important concept in most spiritual systems. Buddhism considers it a prerequisite for Satori or Enlightenment. ‘Karuna’ is compassion and as we develop it we find ourselves more in tune with the universe. Healing comes naturally. We see oneness in all of creation. 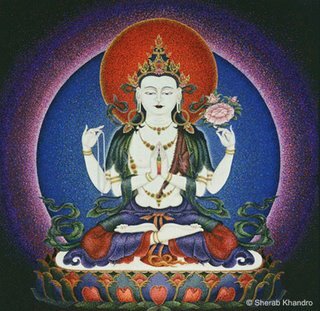 Karuna Reiki is not a substitute for traditional Reiki. In fact it is taught only to level two practioners of Usui Reiki and the Karuna Reiki mastership is given only to Usui Reiki masters. There is a definite difference to the feel of both the energies. Karuna feels softer and more enveloping but the healing is deeper with a combination of both systems. There is a faster and more concrete spiritual growth which I think is the ultimate purpose of any holistic healing system. There is also more self growth as energy blocks surface and clamour for attention! As we deal with these and clear them off with healing we experience many changes in ourselves and life situations. We are forced to look more deeply at issues that are causing stagnation in our development and work more diligently at cleansing and healing with faster and more concrete results. Working with issues of self growth is not always comfortable but with Karuna Reiki we are able to look at ourselves with compassion and see clearly what we need to clear off and what to bring into our lives. By incorporating Karuna Reiki with Traditional or Usui Reiki we are that much more empowered. And I think that right now we need all the help we can get!